Camping is our New Zealand thing. From quirky old-school caravans to smart new-school glamping or campervans, we love to shed real houses, shed our shoes and get back to nature. We asked four experienced campers to give us their tips.
. No power supply, no generators, pack it in-pack it out, and a spring-fed water supply. It's quiet enough that you can get totally lost in the trees and stumble on to your very own beach! In the daytime the birdlife is amazing - saddlebacks, tui, kereru - the sounds are intense. In the night time, a walk under moonlight will reward you with tuatara, kiwi and the distant dazzles of Auckland. I've been fortunate enough to spend weeks at a time on the island with volunteers, potting and planting trees, releasing trees, cleaning up the beach. It's an absolute gem and only 20 minutes from New Zealand's largest city! Having said that, I was up at Cape Reinga and we checked out the Pandora campsite. It might be next on my list - just around the corner from Kapowairua (Spirits Bay) and the outstanding Waitahora Lagoon, accessible by an hour's walk and nestled right on the beach. Gorgeous! Favourite piece of kit: I was camping in the Blue Mountains recently and a guy showed me a little container with a cotton ball soaked in Vaseline. It starts a wee fire even when the wood is slightly damp. Although not useful when there are fire bans. Best camping recreation: Old school campground games (torch spotlight, beach cricket ...) and surfing and snorkelling/free diving. I strap a pair of fins and snorkel to my pack to explore the magical underwater world. Can't travel without my: It's a little too chunky for my usual lightweight pack but a compact 50x optical zoom camera - the size of a sizeable grapefruit. My first proper independent tramp/camp was 188km across Corsica, carrying absolutely everything for 14 days. I didn't take my camera because I thought it was too heavy ... never again! Fail-safe magic ingredients: Dried chilli - in everything! Camping dream: A yacht to cruise the South Pacific, pulling into remote beaches with a hammock tent. More realistically, two kayaks and a safety beacon from the mainland out to Motuihe with my dad. As a wee kid sitting around the campfire listening to my dad's tremendous stories of treks and camps across far flung corners of the globe - Papua New Guinea, Russia - we used to dream up kayaking adventures all over the world, catching our own food. What we love most about caravanning: It's the opportunity it affords us to celebrate the beauty and diversity of New Zealand and the family memories it creates. I have a deep-seated love of our great outdoors and have been fortunate to do many of New Zealand's great walks. I want our kids to feel a few of what I call my "epiphanic" moments in the outdoors and to feel grateful for the chance to do it. We've dragged them and the caravan from the top to the bottom of New Zealand and we've been lucky to enjoy many life-changing experiences along the way. The caravanning lifestyle is a chance for us to regroup as a unit. Our favourite magic campgrounds: Maitai Bay in the far north, Mr Simpson's paddock at Simpsons Beach in the Coromandel, the White Horse Campground at Mt Cook and Newhaven Holiday Park at Surat Bay in the Catlins. A real highlight was our trip to the Catlins last summer - the coast road south of Oamaru and the Moeraki Village Holiday Park, a traditional campground above the boat harbour very close to the must-visit restaurant Fleurs Place. From our camping spot, we did sunset and sunrise walks to the Katiki Point Lighthouse to view baby penguins in their ground burrows, and large numbers of fur seals hauled out to rest on the rocky platforms, and one of the largest sea lions we had ever seen. Our love for the travelling lifestyle began in 2009 when we relocated a Kea Campervan from Christchurch to Auckland It far surpassed our expectations and offered us our holiday future. Favourite piece of kit: We're spoilt rotten. Our new Leisure Line caravan offers us all the conveniences of home - a hot shower, kitchen, large fridge/freezer, solar panels and plenty of water. But Raymond's favourite accessory is definitely the remote control caravan movers, so we can park anywhere without hassle. Best camping recreation: Taking off to explore the area by foot or by bike. Every holiday also includes at least one decent hike, swingball and a soccer ball for our 11-year-old son, Ari. Can't travel without: Good food, wine, books and a tent for the kids in summer. Fail-safe menu: A staple is beef mince nachos with blue corn tortilla chips - great after a decent day outdoors too. Money-no-object camping dream: Ticking off each continent in a self-contained motorhome with no time restrictions. My favourite off-the-beaten-track camping spot: My camp cooking experiences started at a little river camp back in the 50s (Klondyke Corner) on the way to Arthurs Pass in the South Island. Lake Brunner on the West Coast was another memorable stay and in the North Island, Tairua always had the best little motor camp and fishing spots. 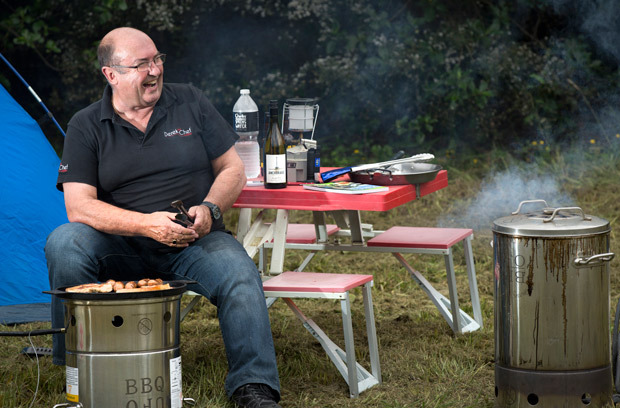 Favourite piece of kit: If we're going away I really need to pack our UFO cooker as this will barbecue, smoke, steam or roast and is so light and easy to use. If I'm lucky enough to find anything, I can smoke snapper, roast lamb or steam crayfish. Best camping recreation: Always fishing or cruising around with our five-year-old son Carlos on the jet ski. Night time would be bullrush or spotlight with the kids plus the occasional spotlit flounder session. Can't travel without my: Wife, son, camera and fishing gear. No matter where you are you will always see someone or something of interest. Fail-safe camping recipe: Lamb leg boned with rosemary and garlic (marinated in a zip lock bag with mint, parsley) and roasted with onion and sauvignon blanc. Snapper with garlic and thyme (en papillote - or in my case, foil parcels) with lemon juice, chilli flakes, onions and tomatoes - and plenty of butter. Camping dream: Motorhome around the whole coast of New Zealand with my Seahorse longline, fishing gear and barbecue to meet many different cultures and learn about cooking their food their way. Interesting for me and an education for Carlos. Our favourite campground: That's easy - Port Waikato Holiday Park. It's the most incredible west coast beach. Never overcrowded, I love it. I love how the black sand burns your feet and you have to sprint to the water to cool them. I love that you can go searching under the rocks for those giant orange crabs. I love that you can walk right around the estuary and sand dunes to Sunset Beach. All just over an hour from the city. Best camping memory: Family camping at Ruakaka as a kid - the campground trampoline was where I first noticed girls were kinda nice! It was blisteringly hot and sunny for the first few days and when you woke up the tent was like a sauna. Dad is a horrible snorer and kept us (and our friends) awake all night. Then the rain came down and we spent lots of time playing charades in the big family tent - I am the king of charades! Favourite piece of kit: For me being a Dad - the iPad so if the weather turns to custard the kids can watch a movie. Also the UE Boom speaker, which connects to your phone by Bluetooth so you can play tunes while you sink a few cold ones at night/afternoon/(morning sometimes ha ha). 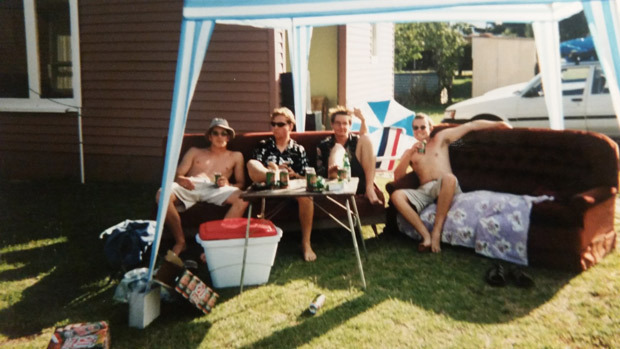 Best camping recreation: Going off fishing with the lads would be the ultimate chilled way to spend a day - we usually come back with nothing but feeling far removed from reality is amazing. Sunset Beach (Port Waikato) has an amazing fishing spot - you walk around the rocks for 45 minutes and arrive at a really high rock where you set up and the tide comes in all round you. Can't travel without my: Navman. I don't know what I ever did without it. If I don't have it I just drive around like a goldfish and have to ask people who work in small gas stations, then I end up in the middle of nowhere! Fail-safe camping ingredients: Eggs! You can make them into so many different things - scrambled, fried, poached, omelettes, boiled. And that orange-coloured South African braai seasoning makes any meat taste amazing (my friend Marnus from South Africa showed me this little miracle in a bottle). Since you will cook every single meal on the barbecue, this is your best friend! Money-no-object camping dream: Love to take the family driving across the US and camp at some weird backwater campgrounds. You know, the ones that have some dude who looks like Joe Dirt working on reception.